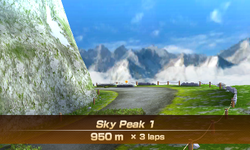 Sky Peak 1 is the first track of the Sky Peak series in the horse racing sport of Mario Sports Superstars, as well as the first track of Champion's Cup. 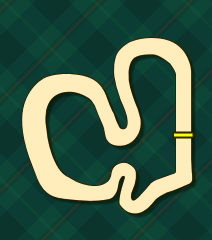 As with the complete set of Sky Peak tracks, it is unlocked when players clear the Star Cup. Also, it is the track that is played on when players take their horse for an outing in the stable mode. The track has a distance of 950m, sharing this length with Sky Peak 3, making it and Sky Peak 3 the second-longest track in the game. Sky Peak 1 features rocks on top of snow, which slows players down, meaning that players need to jump on top of the rocks as stepping stones to traverse the area without losing speed. The track also features rock ramps with stars on top of them. The beginning of the course starts out with a gentle curve to the left, where players need to maneuver past a small cluster of trees. Past this area, players can go on a dash panel to travel through an area covered with snow; players need to leap on top of small rocks as stepping stones to traverse without losing speed. Players then need to perform a sharp hairpin turn to the right, where several carrots and stars can be found on top of more small stones with snow underneath them. The leftmost route of this area leads to a rock ramp and small jumps avoiding the small stepping zones with less items available to the player. Past this area is a curve to the left, with hedges for players to jump over and carrots on top of the hedges. In this area, players can take the outer path on a narrow rock ramp that leads players to a cluster of stars, this portion of the track being the only way to obtain stars. After this turn, players can take a dash panel on the far right of the track, where players then jump over a hedge. A tight hairpin curve awaits, with a line of carrots for the player to obtain, which leads to another hairpin curve with another line of carrots to collect. The last stretch of the track is a narrow area with many hedges and stars on top of those hedges; players can also bump into the boulder jutting out on the right area of the track that slows them down in a similar manner to hedges and trees. The first parts of the course. Past the trees, with the dash panel leading to rocks with snow underneath. An area with snow underneath rocks, with many items on top of the rocks. The left path is a ramp that avoids the terrain, with the cost of fewer items. A curve to the left, with hedges and a rock ramp on the farther edges of the course. The last area of the track, with hedges and boulders to avoid. This page was last edited on September 10, 2018, at 22:20.